Sign up to receive exclusive songs, music videos, announcements, & more! HEART RATES - Chrms ft Zoya out now via Chill Planet Records. Follow the link below. USA TOUR with KAWEHI : tour dates out now in a city near you! natural disaster. is out now via iTunes, Apple Music, Spotify, BandCamp, Soundcloud and more! Keep My Body Moving Live @ antiSocial in Mumbai for Zoya's launch show for "natural disaster." releasing October 4th worldwide. Check it out below. #Exclusive: Rolling Stone India will launch Zoya's newest single Keep My Body Moving on September 6th from her upcoming album natural disaster. WATCH : SHE SELLS - Zoya's latest music video + single that was premiered by ELLE India last week. Check out the article + video below. Rolling Stone India featured Zoya on her first time touring in India and what is to come. One electronic remix compilation featuring 9 producers who have remixed Zoya's songs. All the proceeds will go directly to install electricity in various schools in Udaipur, India. To learn more, donate, and share visit HERE. The Girl Who Tour was such a success! Zoya made a Tour Diary to share with you her travels. Thanks to MTV Indies, Golden Mixtape, Black On The Canvas, Prelude Press & Literally, Darling for all their lovely interviews and features while Zoya was on the Road! Zoya's latest music video for the lead single, What's Done Is Done, off of The Girl Who Used To Live In My Room! It was premiered exclusively in India by Pepsi MTV Indies, and raved about here in the US by Prelude Press! The Girl Who Tour is officially announced! Ticket info above, poster below. The Girl Who Kickstarter has been officially FUNDED! With 86 backers and over $1,000 over her goal. Check out her happy face listening to her newest album that was just mastered. releases in July, pre-release for Kickstarter Backers this June! Help fund Zoya's Full Length Record Release - The Girl Who Used To Live In My Room - & Official Tour 2015 through Kickstarter! Pepsi MTV Indies began airing Zoya's newest music videos! 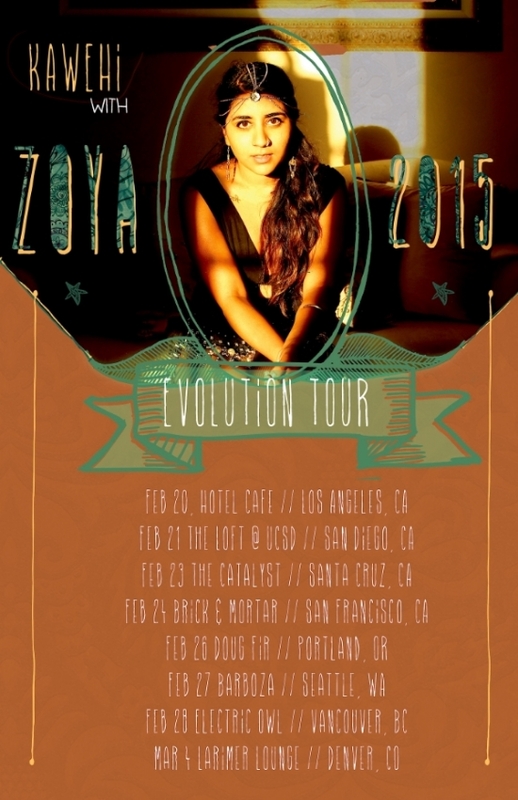 The Evolution Tour kicks off Feb 20th! Zoya's going on tour with the infamous looping one woman band - Kawehi!